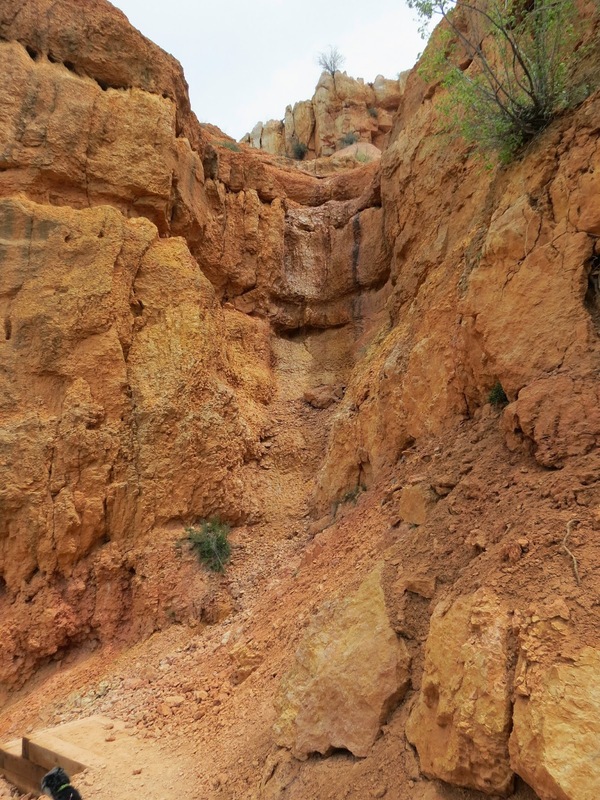 We drove a new route for me on our way from Zion to Bryce, a very scenic Utah Highway 14. From this overlook you can see Zion Canyon, 56 miles away. Zion National Park, seen from UT Hwy 14. At the next overlook we could see Navajo Lake, the source of the Virgin River that flows through and created Zion Canyon. WE could see a National Forest campground across the lake and decided to come back after visiting Bryce for a few days to hike and kayak. But first we will hike one of the trails here...to Cascade Falls, the headwaters of the Virgin River. 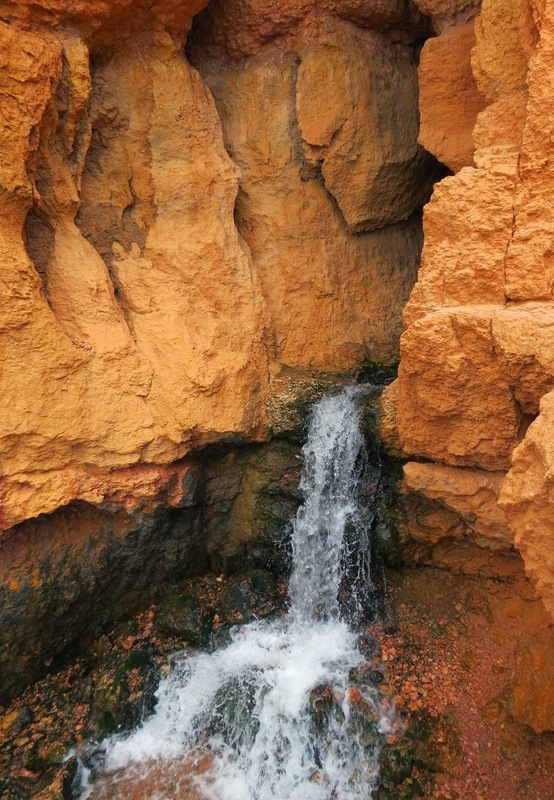 The water leaves Navajo Lake through sinkholes and emerges through a cleft in the rock as Cascade Falls. A smooth gravel road leads to the trailhead. Thistle is happy this is a National Forest and he is allowed on the trails. 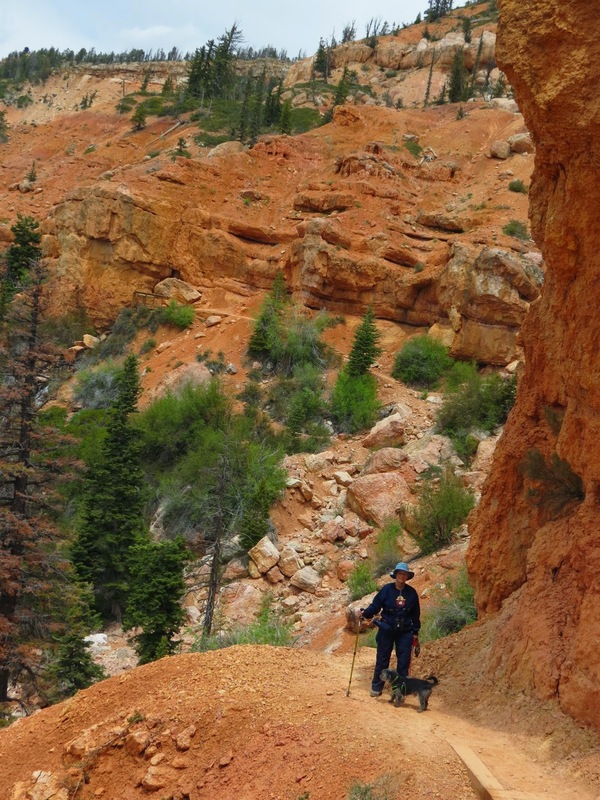 There are spectacular views all along the trail as it follows the rim. Nearing the end of the trail and falls overlook. A little water was seeping out here too. It levels out up here, Birdie. From the cleft in the rock flows Cascade Falls, headwaters of the Virgin River. And from there it cascades down the mountain. It means a lot more having seen Zion Canyon and the Virgin River as it flows there. And then we retraced our steps back along the trail. A view of Zion Canyon from the trail. More great pics. The one with the steps going down one side and up the other is really neat. Love the fact that you are also able to get some with the two of you together.